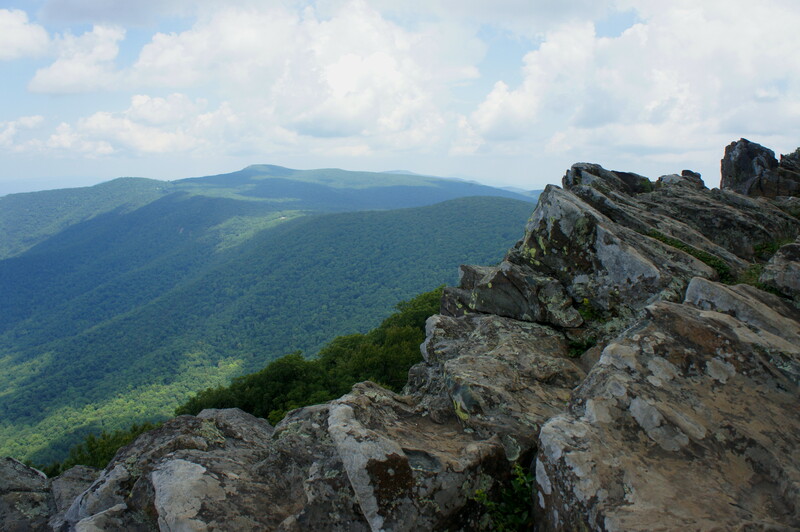 At 4,050 feet, Hawksbill Mountain is the highest peak in Virginia’s Shenandoah National Park. 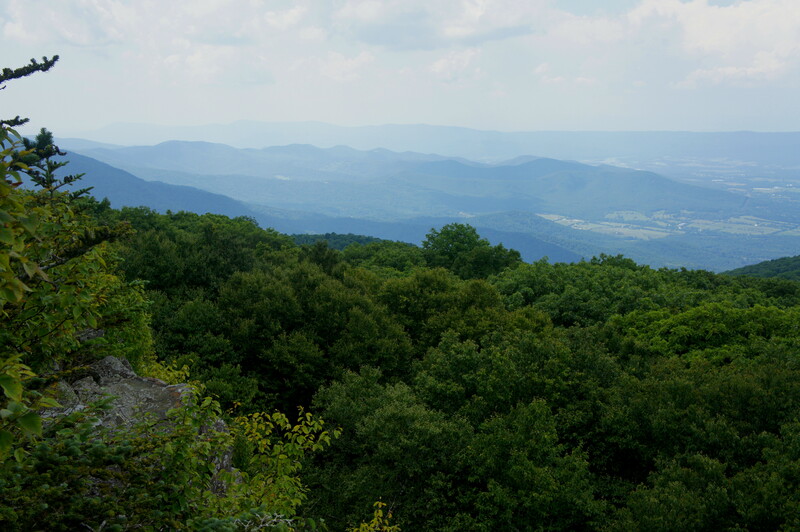 The summit offers panoramic views of the Blue Ridge Mountains, as well as mighty Massanutten Mountain to the west. It’s a short, albeit steep, climb to the top, making Hawksbill a popular day hike destination; more ambitious hikers, however, can head farther south to complete a nearly 9-mile loop that captures additional overlooks and lush meadows. 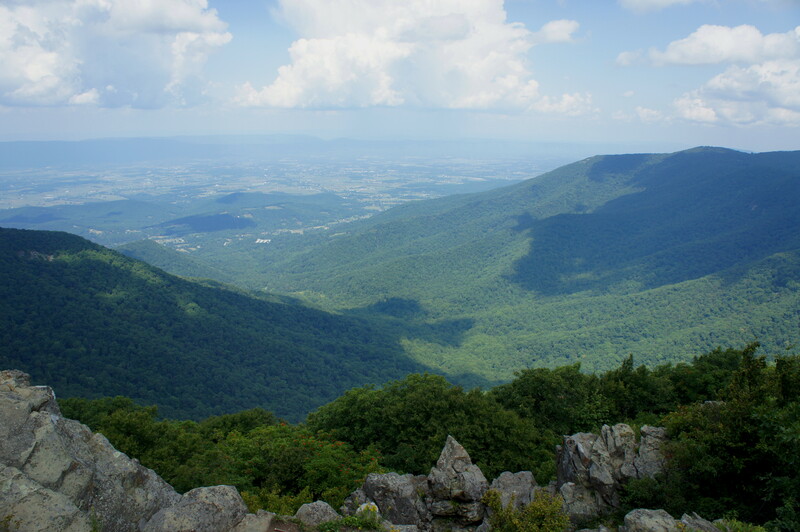 Start and end at Hawksbill Gap, located along Skyline Drive roughly 14 miles south of the Thornton Gap Entrance Station in Shenandoah’s Central District. 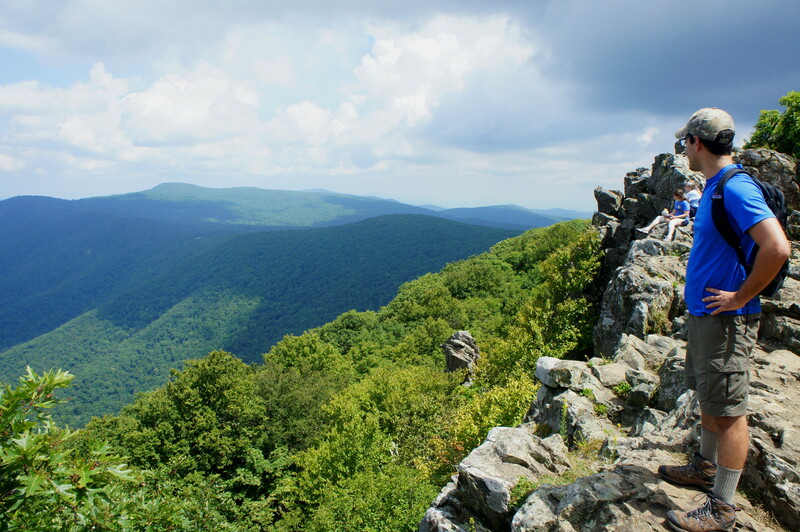 Hawksbill Gap serves as the trailhead for a number of popular hikes (including the fantastic Whiteoak Canyon-Cedar Run loop), so arrive early to get a parking spot. 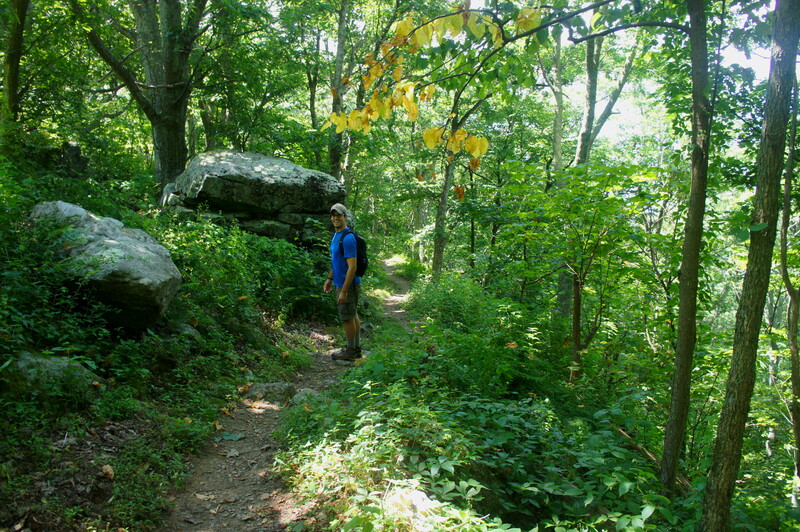 The first leg—the 0.8-mile Lower Hawksbill Trail—heads west from the parking area and immediately begins to ascend a rocky slope. The route is relatively wide and partly graveled but climbs at a persistent clip, gaining nearly 700 feet in elevation in less than a mile. Summer days are likely to see a lot of commotion from hikers and picnickers near the first trail junction, just a stone’s throw from the summit. Bear right and emerge from the woods at the sight of the Byrds Nest Shelter #2 (day use only), situated in a small clearing a short walk from the precipice of a rock outcrop offering fine views to the north and west. Bear right again and follow the path for 50 yards to Hawksbill’s true summit; the neatly-maintained overlook offers 270-degree vistas. 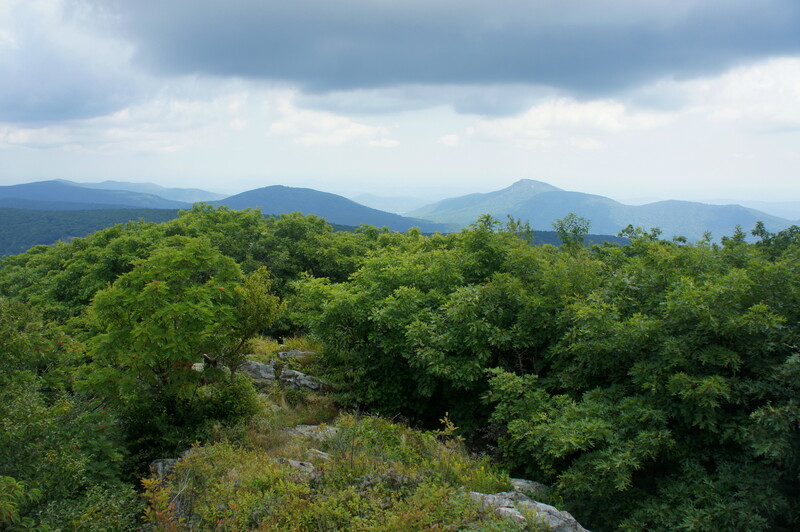 To the east, look for iconic Old Rag Mountain (3,268’), as well as Robertson Mountain (3,296’). Looking north, the highest peak in view (besides Hawksbill, of course) is Stony Man Mountain (4,011’), fronted by Pollock Knob (3,580’) and Bettys Rock (3,680’). 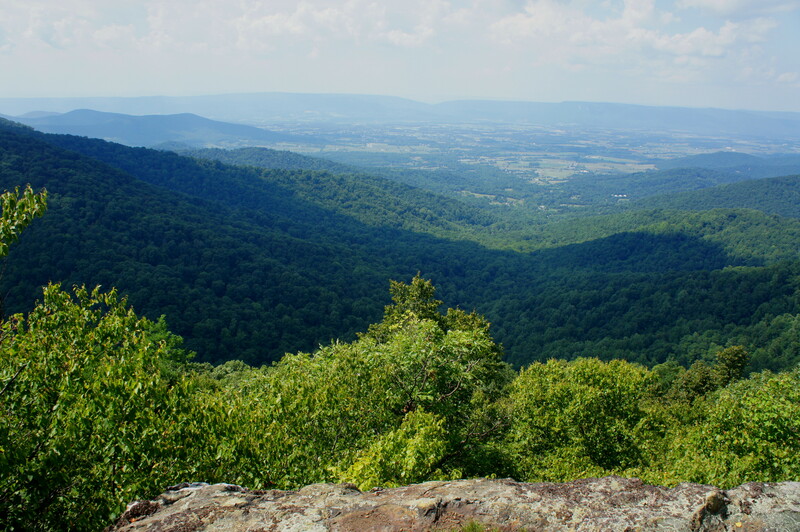 Down below is Timber Hollow, feeding into the patchwork of farms and forests of the Shenandoah Valley. Across the valley is Massanutten Mountain, a behemoth extending dozens of miles to the north and south. Rounding out the view is tree-covered Nakedtop (~3,750’) in the foreground. Find a good spot for a lunch or snack break, then retrace your steps back into the forest to the Hawksbill trail junction. Bear right and continue for roughly 1/10 mile to a second junction; turn right again, embarking on the winding Salamander Trail. Nearly immediately, a rock outcrop offers additional views to the west. 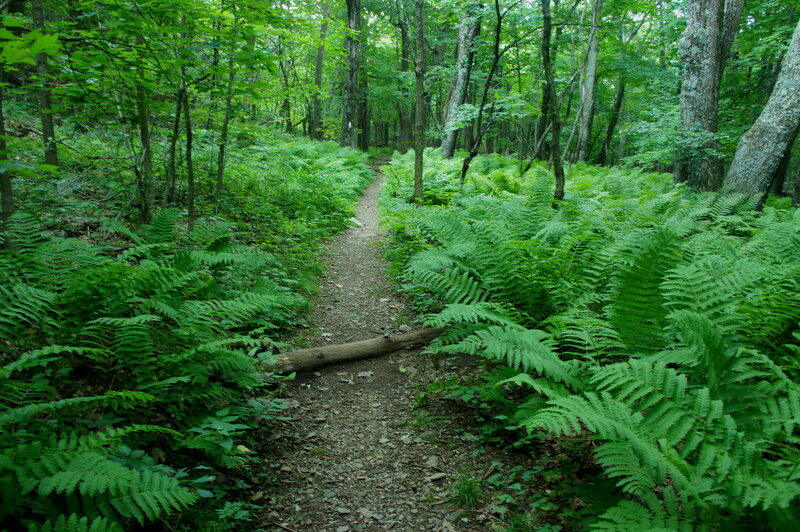 The Salamander Trail lives up to its name, sliding gingerly down the hillside in a series of S-curves before meeting the Appalachian Trail (AT) after about 0.7 miles. Bear left on the AT, following the route through a sea of ferns to the next trail junction—a short spur trail to the Rock Spring Cabin. Continue straight on the AT. The AT section that follows is very interesting, especially as the gradient off to right steepens to near vertical and lichen-covered rock faces dot the upward slope on the left. 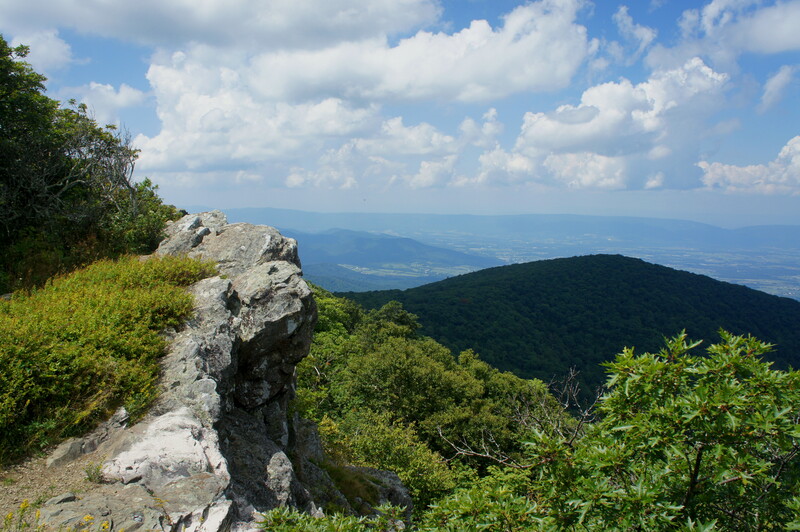 The trail skirts around Spitler Knoll then gradually descends to the Franklin Cliffs area, where a half dozen rock crags offer excellent views of the Shenandoah Valley and Kite Hollow. Before you know it, the AT spits out onto the Red Gate Road at Fishers Gap, your cue to turn left (leaving the AT) and cross Skyline Drive to the east side of the ridge. 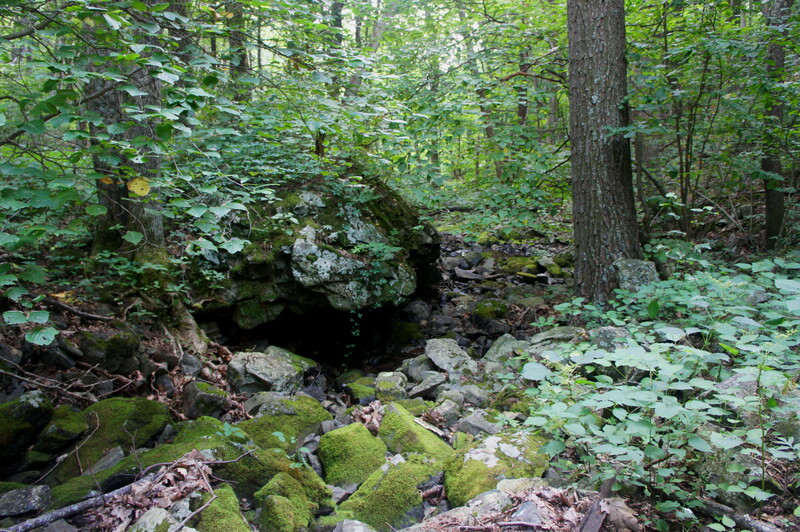 Here the Rose River Fire Road descends gently into a wooded hollow; roughly 30 yards down the gravel track, bear left onto the Skyland-Big Meadows Horse Trail, your guide for the remaining five miles back to Hawksbill Gap. 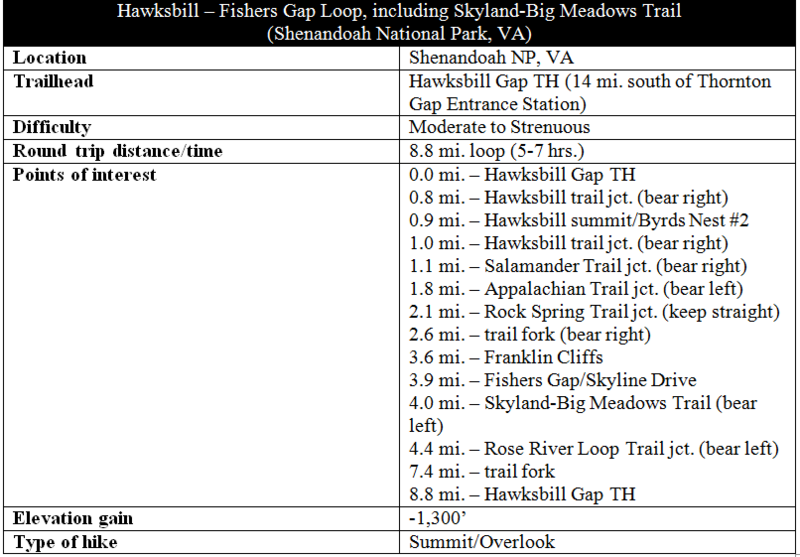 Lacking sweeping views, the Skyland-Big Meadows Horse Trail is admittedly less interesting than Hawksbill and the AT. But beyond the first junction—which leads down to Rose River Falls—it is likely to be devoid of crowds. The route weaves gently north before crossing Rose River and a nearby tributary. The incline increases significantly after about two miles on the Skyland-Big Meadows track, ascending through woodlands partly decimated by some sort of fungus or beetle (?). The trail climbs more than 600 feet to the rounded top of Spitler Hill (3,720’)—alas, there are no views—where pine trees line the trail. With Skyline Drive within earshot, bear right at a trail junction. 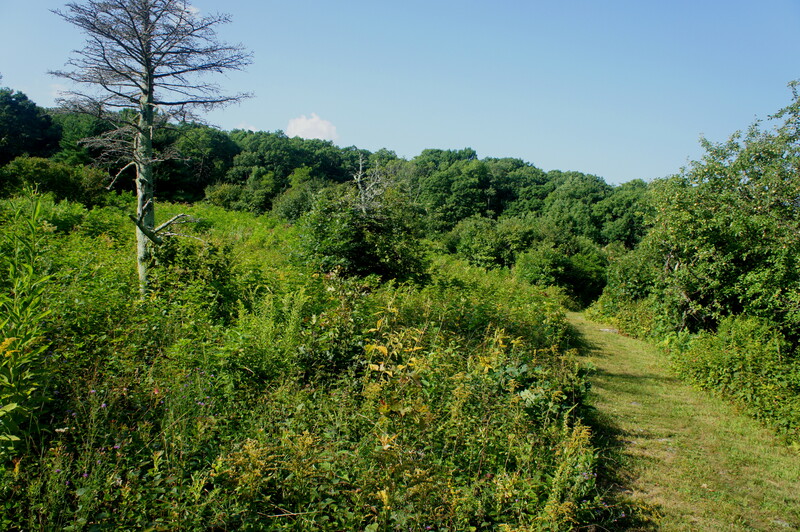 The 1.4-mile stretch that follows is easy and straightforward; paralleling Skyline Drive (from a distance), the trail cuts through two minor meadows before returning to the trailhead. Cross the road to return to the start. With the exception of strenuous climbs at Hawksbill and Spitler Hill, most of the loop is relatively easy. Nonetheless, it’s best to allot most of a day to complete the 8.8-mile circuit. This entry was posted in Moderate Hikes, Shenandoah National Park, Virginia and tagged Appalachian Trail, Byrds Nest Shelter 2, Fishers Gap, Franklin Cliffs, Hawksbill, Hawksbill Gap, Hawksbill Mountain, highest point in Shenandoah, Kite Hollow, loop hike, Lower Hawksbill Trail, Red Gate Road, Rose River, Rose River Fire Road, Salamander Trail, Shenandoah, Skyland-Big Meadows Horse Trail, Skyland-Big Meadows Trail, Skyline Drive, Spitler Hill, Timber Hollow, Virginia. Bookmark the permalink. 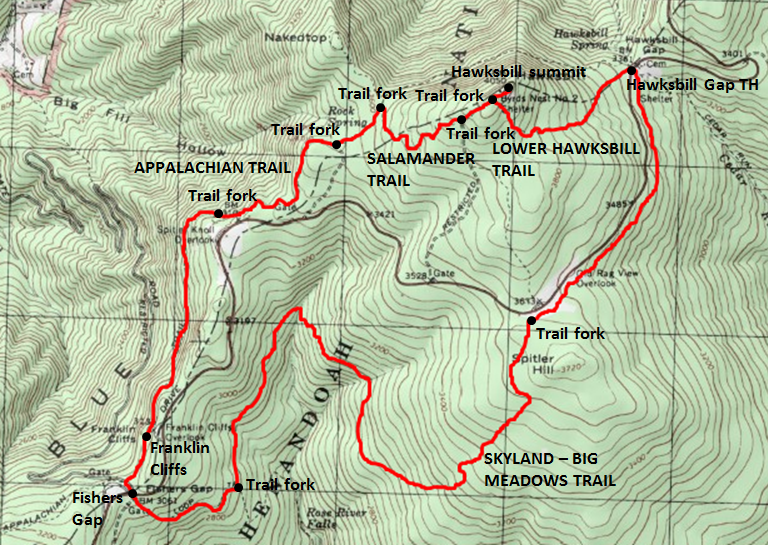 Can you explain the difference between “upper hawksbill trail” and “lower hawksbill trail”? Seems like upper starts at mile post 46 and lower begins elsewhere?